The Spire Health Tag is a wearable that sticks onto your clothes and aims to help you sleep better, de-stress during the day and track your activity. It’s made by the same company that wanted to keep us calm with the clip-on Spire Stone. With its sensor-packed Health Tags though, Spire's CEO Jonathan Palley told us that it wanted to solve "the user experience problem we've always believed existed for health monitoring wearables". That problem was to do tracking discreetly, and you can certainly do that with this device. The stick-on Spire Health Tag is available in packs of 3 ($99) and 8 ($299) with single Tags available for $49. There's also a Spire+ program that gives you unlimited free Health Tags for a $10 monthly fee. The tags are also waterproof so can survive a spin in the wash. Each Tag also delivers 1.5 years worth of battery life, so there's no need to worry about charging for some time. We’ve been living with the Spire Health Tags attached to our clothes for over a month now, to find out if these are the future of monitoring your physical and mental wellbeing. It's fair to say that the Health Tag doesn't look like any other wearable I've had my hands on or worn. It's a massive departure from the Spire Stone, that's for sure. There's nothing sleek, attractive or really desirable about it. But then that's not a problem here when it's going to be hidden away. Size-wise, the Tag is about the size of a Band-Aid, with a soft, felt-like material that covers the tracking sensors beneath. On the other side is the white plastic that conceals the adhesive part that sticks the tracker to your clothes. 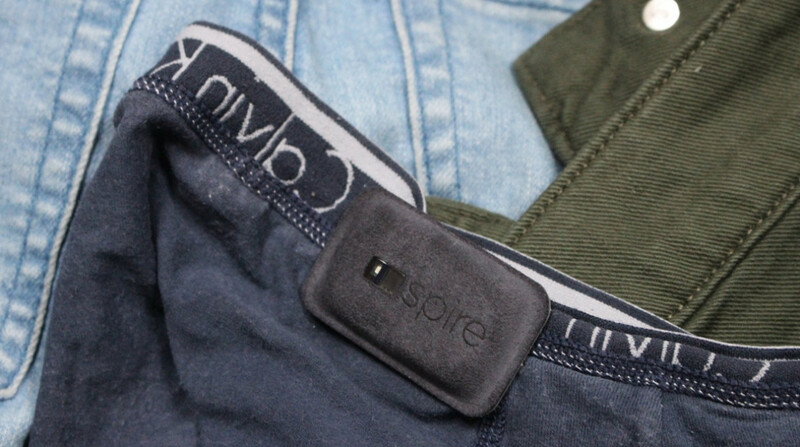 Spire suggests that with multiple packs of its Tags that you stick them onto the clothes you wear the most. So in my case, underwear and compression shorts I tend to use for the gym, running and playing football. I had an 8-pack of the Tags to try out, and while that sounds like a lot, I would have benefited from having more. I don't think I'm alone in having a drawer that consists of more than eight pairs of underwear or multiple pairs of shorts for the gym. So if you're not regularly washing the items with the Tags, that's a bit of a problem if they're all sitting in the laundry basket. It's where the idea of subscription program makes a lot more sense here. From a comfort point of view, the Tags didn't provide any sort of irritation while I was wearing them. It was initially a weird sensation having a wearable positioned on the inside of the waistband, resting against my skin, but it didn't take too long to forget it was there. None of the Tags have fallen off either, which is definitely good news when you consider how much they cost. One of the Tag's aspects we really appreciate is the washing machine-friendly design. You're only going to need to take them off when the battery runs out, so it needs to survive some time in with the rest of the dirty laundry. So what do the Health Tags actually pack to track your data? Spire has included a range of sensors including its own proprietary respiratory sensors which measure your breathing, giving you a better understanding about your stress levels in real-time. It also squeezes in sensors to track sleep, heart rate and heart rate variability. The Tags can also automatically detect workouts tracking calories, steps and heart rate. Before you stick those Tags onto your clothes you need to get them paired with the companion smartphone app, which is currently iOS-only (sorry, Android users). The good thing about this pairing setup is that if you have multiple Tags, you only need to pair one and at the same time it'll pair the rest in your pack. All you need to is firmly press on the LED sensor that's visible on the tag to wake it up and you should be good to go. Once you've filled in some pretty standard profile data (height, weight etc), it's time to get that Tag stuck on. Once it's on and correctly in place, you can begin to see the data the Tags can monitor inside of the app. Here's a breakdown of the sections and what you can expect to see. Under the Now tab you can see your real-time data with a floating wave illustrating dips and peaks in your data. It's here you can see your resting heart rate, breathing rate and step counts. A blueish-green floating wave will indicate that your breathing is calm. If it turns red, that's a signal that your breathing is tense and that you might be feeling stressed. In the top right hand corner of the Now screen is an icon filled with a cluster of small green circles. Tapping this brings you into a guided breathing mode where these small green circles are suspended in the air and replicate your breathing. If you are breathing too quickly, it'll tell you to go slower. When you're on the money, it'll let you know. This is your place to receive personalised recommendations based on the data the Health Tags can record. These are broken down into Stress, Sleep and Activity. Once you've decided to subscribe to a particular LiveInsight, you'll then receive alert notifications. So that could be making sure you are moving every hour of the day, getting reminders about sleep time and duration or getting a gentle reminder to take a deep breath every hour. Unfortunately, not all of these LiveInsight programs are live yet, but will get added to the platform. If you want to examine all of your data, this is the place to do it. You can view data displaying calm, focus and tense minutes during the day. Dig deeper and you can see the periods of the day you are most calm (morning, afternoon, evening). It'll also pin points times of the day that are notable. These are the periods you've managed to stay calm or focused for 15 minutes or more. The Tags can also record workouts and sleep too, storing some glanceable data that can be expanded to dig deeper to view in more detail. It's all nicely presented and gives you a quick overview of the day without throwing too much data at you. There is inevitably a place to tinker with how the Tags work, but most of these settings are centred around your experience in the app. So you can control how notifications are delivered, adjust activity goals and sleep goals. It's also a helpful place to see all of the Tags that have been connected. If you've managed to lose one, you can send a vibration to the device or light up the LED to help locate it using Bluetooth. It's not the most powerful vibration (or the biggest LED) so it still might be tough locating in a big pile of washing. But it's nice to see that Spire has recognised that the Tag could be easy to lose. As far as the Health Tags' ability to replace your Garmin or Fitbit fitness tracker goes, the discreetly worn wearable keeps things pretty basic. It'll count steps, keep track of sedentary minutes (times you've been inactive for) and let you know whether you've hit your activity goal for the day. That data is displayed inside the Stats section of the app where you can dig deeper to see further details on estimated calorie burn, distance covered and heart rate. If you go for a run or a gym session, the Tag will register this activity, but it won't distinguish it as an activity separate from your daily steps. The data though is at least all well presented and easy to digest. In terms of accuracy, we compared it with the stats we collected from the Garmin Forerunner 935 and the Fitbit Versa and found there was a difference of 2,000 steps at times – the Health Tags usually reporting the lower step count. I'm not saying that the Fitbit and the Garmin trackers are more accurate. In fact, I'd expect something measuring from the waist to be more reliable than something doing it from the wrist. But that's a big difference in comparison to the other two devices. The Tags do also record heart rate data, displaying an average, minimum and maximum heart rate for the day. However I wasn't wholly convinced by the data most of the time. Average daily heart rate was generally always higher than comparison devices, while minimum heart rate was reported as being as low as 39BPM at times. Maximum heart rate readings were abnormally high as well on occasion. I do wonder had I worn them higher up the body if that may have improved the performance of the heart rate monitor. A problem that did have a tendency to contribute to this disparity in the tracking data was when I needed to change clothes. If I headed to the gym without a pair of shorts with a Tag attached, I was missing out on data. But there's also the problem of when you do remember that Tag, you also need to remember to sync the data straight away. There's a big onus on remembering where those Tags live and which ones still have data to sync. Especially when you have a small number of them. These Tags can also automatically track sleep and on paper, they seem like a much better way to monitor bed time as opposed to wearing a watch. In the companion app you'll get a breakdown of REM Sleep, light sleep and awake time. It'll also offer you an average for each of those aspects of your sleep. Again, I compared the data with the Forerunner 935 and the Versa and found on the whole the data was pretty consistent. It was never identical, but breakdown of awake, light sleep, REM sleep and time falling asleep generally came out around the same in most circumstances. While the Health Tag perhaps doesn't make the most convincing argument to be your next fitness tracker, there are some more interesting ideas regarding stress tracking. Spire builds on the sensors it introduced with its previous wearables to not only identify physiological markers that indicate a stressed state, but also to act on them. So from the Now section of the app you can see your breathing in real time with that floating wave relaying the data from the Tag you're currently wearing. It's here where you'll also see a record of your current resting heart rate. When you hit one of those stressful moments, that wave of green will turn red. If you've enabled Spire's Reduce Stress LiveInsights, you'll receive a notification prompting you to get your breathing in check. The more interesting insights though lie inside of Stats where you can see a breakdown of the time you've been calm, focused and tense during the day. For each of those you can see specific periods of the day that relates to. So in my case, I was generally tense in the afternoons and most focused in the early afternoon and evening. Once you can start collating that with events and incidents that coincide with those periods of calm, focus and feeling tense, you can definitely get a better understanding of what impacts on those stressed periods of the day. The Spire Health Tag delivers on that promise of discreet tracking. You really do forget about them and it's an impressive feat with the amount of data this washproof wearable can serve up. We were promised fitness tracking and stress tracking, but it's the latter that this device feels best built for. To get the best experience, investing in a big batch of them is pretty much a necessity, which can start to get pricey if you don't go the subscription route. If you care about stress tracking and like the idea of a wearable that's never on show, then the Health Tags will have some appeal. If you're hoping for a fitness tracker replacement as well, you might be left a little disappointed.